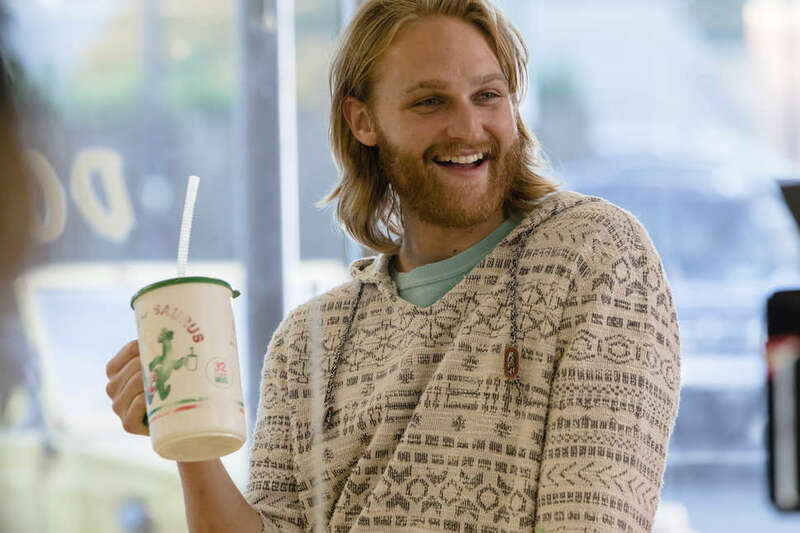 Dud, the character played by Wyatt Russell on AMC's Lodge 49, is a classic California dude. All he's ever wanted to do in life was to surf in the mornings, help his dad at his job cleaning swimming pools the rest of the day, and do some low-impact chilling at night. This was a life Dud liked. But then he injured his foot -- beyond repair. And then his father disappeared, leaving behind a mountain of debt. Dud lost his family home and his dad's pool-cleaning business, and his surfing days were suddenly over, too. So when we meet him in the first episode, he's completely unmoored, with no purpose and no place to fit in. (He can barely scrounge enough money for gas, let alone a place to live.) But then he stumbles upon a mysterious fraternal lodge, whose members offer both beer on top and some strange alchemical philosophies. Dud signs right up -- this could be a sign from the universe! Thrillist: I'm from the area around where this show takes place, so it was fun to spot familiar locations. What was your familiarity with Long Beach prior to shooting there? 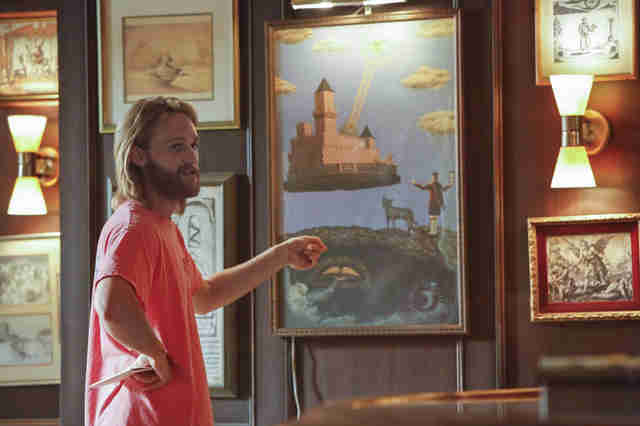 Wyatt Russell: Oh, cool! Yeah, I'm actually very familiar with the area. I used to play hockey at Glacial Gardens in Lakewood. We actually shot really close to where I played. I spent pretty much every day after school there from the age of 10 to 15. It's funny how it hasn't changed in some respects, how some places are still sort of stuck, very elegantly and timelessly, in the world our show is set in. The industrial aspects, where you drive by and you go, "What is in there? This is a building with nothing on it." The industrial parks everywhere. The smoke stacks. The pipes going from the roof to some wall somewhere. There was something charming about it, because you knew something was happening in there, like they built pipes for plumbing, or they built steel girders for rafters. They built stuff that made the world happen. Russell: Exactly. And that's part of what the show's about. You're losing those industries -- things are becoming more streamlined, things are becoming more automated -- so those places are becoming sort of relics of a different time. But yeah, it's interesting to see now. It was sort of like coming home, in a weird way, to a place that wasn't my home. Russell: Oh, really? That's funny to me, because it is safe. It's not like you're going to go into the water and you're going to get attacked by a shark every time you go in. It's the trick that the media plays on you now, because it's so easy to think, "I'm definitely going to get attacked by a shark." You know? It's funny how we look at those as things that could really happen to us, even though they only happen like 19 times a year. And it's funny, because I look at it the same way: "There are sharks?!" [Laughs] Just stay in the surf, maybe? Russell: I'm horrible. Do. Not. Surf. I've tried it a couple times, and I kind of got up… for a second? But I'm bad at it. Horrible. Let's not fool ourselves -- they would have to use a surf double. I mean, maybe I could get good enough if I knew I hadto do something? And I had a few months? And then they could cut to the double. But I'll never be good enough to pass. Russell: Yeah. There was a scene in the first few scripts, which didn't make the final draft, where Dud calls his dad from Nicaragua, and he's crying on the phone, "I'm so fucked, I'm so fucked." When I got hurt the last time and I pretty much knew it was over, I called my dad from the locker room. So I was like, "Wow." It didn't even matter that it wasn't in the show. What mattered was that was the sentiment of the show. You look for those things, too, when you try and do anything. How does it apply to my life? Like I didn't know what I wanted to do, but I felt that I could be good at this acting thing. I was good at playing make-believe in my own head. And I wanted to give it a shot. So I didn't wander. I didn't languish. I knew it was time to move on, and I jumped in with both feet. Dud sort of has nothing else, and nobody to guide him. That's when he finds Ernie, who can be his guide, his knight. And he enjoys that, because he's looking for that guidance. I had that, so I think I was ahead of Dud. I had a plan. Or at least an idea. Yeah, for now, he's just trying to get by. And making perhaps not the best financial decisions, when it comes to the terms of the loans he's taking out from Burt at the pawnshop. Any experience in that area? That was my only experience with a loan shark. But we do live in a world where the cascading debt effect is real. I want to go to a nice dinner? I put it on my credit card. If I have enough money earned, I can pay off that credit card bill. If I don't, okay, I'll just pay a little interest and be in debt. It's how we exist. If we didn't have debt, we wouldn't be able to do anything. But the balance of having debt and being able to do the things you want to do in life, not living beyond your means, is something everybody has a hard time managing, including the United States Treasury Department. Everybody's debt is consolidated at some point, so in some ways, it's the same debt. If it all comes crashing down, the only people who are going to enjoy life as they used to are people like Dud! [Laughs] He doesn't have much to lose. There are things people can learn from characters like Dud, in that way. You don't need the extra car. You don't need the bigger TV. They're nice to have. But you don't needthem. We need a lot less than we think. Russell: [Chuckles] That's a big question. So the basic tenet of alchemy is that you can create something out of nothing. And in life -- and this is what the show is about, and how I view life to some degree -- everything was created seemingly from nothing. I mean, everythingis alchemy, in a way. It took maybe thousands or millions of years for a diamond to turn into a diamond from compressed carbon, but that's the universe making something that we view as magical, and the only reason we view it as magical is that we've put a number on it says, "This thing means something." The diamond industry grew back in the post-war era when De Beers Consolidated Mines decided that you should put a ring on your woman's finger, and told us that diamonds were rare. Even though diamonds are actually abundant. Diamonds are a perfect example of alchemy. You can look at relationships that way, and that to me is the true meaning of our show and its alchemical underpinnings. The lodge, the people in the lodge, and the relationships we choose to make valuable. People are what you think about on your deathbed. Not the things we've bought. Did you by chance learn about diamond marketing through your sister's film How to Lose a Guy in 10 Days? Russell: [Laughs] Why? Is that in How to Lose a Guy? I didn't know that! I don't think I've ever seen the movie. [Laughs] I'm in a car, and we just passed a diamond store. I just thought it was a good representation of something that seemingly has no value, other than the value we put on it. Oil, too. Oil is probably alchemy in the truest sense of the word, where you take this resource, and literally run your entire world on it. And we do deal with oil aspects later on in the season. I love that part of the show, because it's so ridiculous! Dud's favorite hang is a donut shop. Any preferences in the donut department? Russell: Donuts are probably my favorite drunk food. My favorite donut is a warm apple fritter. But I used to have these things called Timbits. Tim Hortons is a Canadian coffee chain, and Timbits are like doughnut holes. And Tim Hortons is my favorite donut shop. Not because they make the best doughnuts, but because I love the vibe. Have you ever had Tim Hortons? It's like the most perfectly Canadian thing ever. Being a Tim Hortons fan is a requisite for honorary Canadian citizenship. [Laughs] It's just awesome. So AMC dropped all 10 episodes of Lodge 49 on AMC Premiere. Russell: Yeah, I saw that! I think it's cool. I think it's a fun one to watch two or three at a time. I don't know if it's a watch-it-in-two-days show. Maybe? I think it really improves the experience for people who love AMC shows, and I think binging is the way of the future. They're trying it out, and hopefully it works.